The hilarious web series "Downward Dog" may have very little to do with the yoga pose of the same name, however metaphorically, it could give major television networks some tips on how to move forward with locking in even more inventive programming in the future. Four words: Go with the flow. In this case, take a cue from the stellar crop of creativity online and morph some of those brilliant gems, like "Downward Dog," into something to savor in primetime. In an ever-shifting entertainment universe, where there are so many screens--and streams--to choose from, that could prove fruitful and avoid excessive tail chasing. The alphabet network debuts "Downward Dog" as a mid-season replacement some time in 2017. It's a wise move and could shift the kinds of new series networks are willing to bank on. "Downward Dog" web series creators and writers Samm Hodges and Michael Killen will executive produce with Mosaic Media Group's Jimmy Miller and Sam Hansen, and Animal's Kathy Dziubek. Kat Likkel and John Hoberg are on board to executive produce the pilot from Legendary Television and ABC Studios. So what made ABC bite? What was so great about the "Downward Dog" web series? The web series features Martin, a dog. But not just any dog. Martin is also the show's philosophical, introspective narrator, a curious soul trying to work on the primary relationship in his life--his owner, Nan. Yes, we're talking about a talking dog here, however the human "voice"--both literally, philosophically and psychologically--works to winning ends. And the endeavor isn't just about the "dog." It's about Nan, a struggling millennial, and having the web series--and the new show--told from the point of view of her lonely and philosophical dog, Martin, is downright brilliant. The web series was screened for attendees at a recent forum at The Palm Springs International ShortFest. It brought down the house. Attendees also learned more about the backstory as to how the show found its way to ABC. Mosaic's Jimmy Miller was in Pittsburgh meeting with Animal on anther project when he first watched the shorts. He immediately saw the potential to expand the narrative into a TV series. (Thank God.) In seeking a home for "Downward Dog," ABC proved to be the best choice--the combination of audience size, success with comedies ranked high, and the network was the most passionate about preserving the creativity and vision of the original material. What can we expect in the series? After just one session at obedience school, Nan and Martin realize that even at their worst, they may be the best thing for each other. It's too soon to know whether the new show will be one of the best things for ABC come 2017, but one thing is clear: this clever web series certainly got a lot of tails wagging. 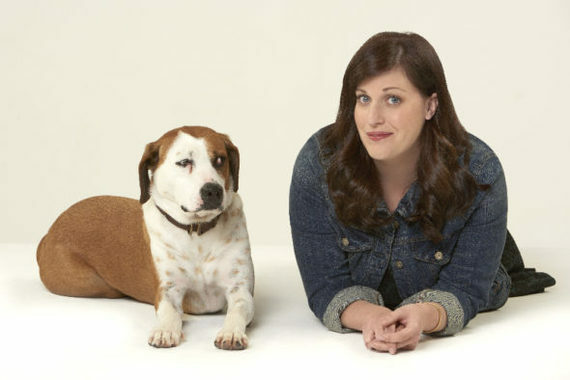 (L-R) Ned (as Martin) teams up with Allison Tolman (Nan) in the upcoming ABC comedy "Downward Dog"